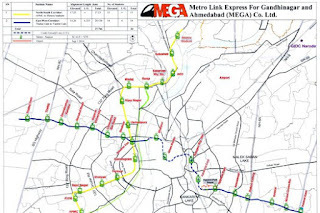 The Ahmedabad Metro system is an urban Mass Rapid Transit System (MRTS) being built to serve Ahmedabad – Gujarat’s biggest city and its capital, Gandhinagar, in the future. Construction for its 39.259 km first phase started in 2015 and is expected to be completed by 2022 (estd.). Detailed planning for its future phases is yet to begin. The North-South line covers a total distance of 18.522km and sustains 16 station which begins from Motera Stadium and ends at gyaspur. 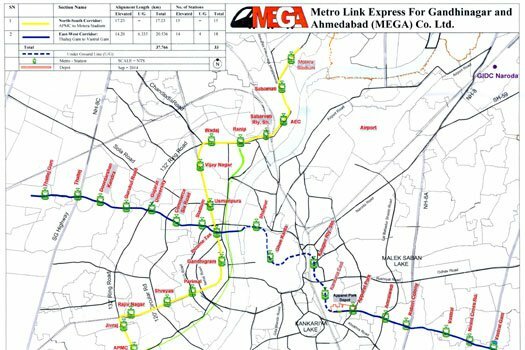 Motera stadim , Sabarmati , AEC , Sabarmati Railway Station , Ranip , Vadaj , Vijay Nagar ,Usmanpura , Old High Court , Gandhigram , Paldi ,Shreyas , Rajiv Nagar , Jivraj Park , APMC , Gyaspur. The second corridor is East-West corridor with a total length of 20.737 km. This East-West line begins with Thaltej Gam and Ends at Vastral Gam which holds 19 metro stations. Thaltej Gam,Thaltej,Doordarshan Kendra, Gurukul Road , Gujarat University , Commerce Six Roads ,Stadium , Old High Court , Shahpur , Gheekanta-Kalupur Railway Station , Karwan Bazar , Kankaria East , Apparel park , Amraiwadi , Rabari colony ,Vastral , Nirant Cross Roads , Vastral Village. Subaru presents their latest revamp of the Legacy lineup with the 2018 Subaru Legacy Sedan.Over the course, Legacy has evolved from a compact car into a mid-size sedan. The latest facelift is spacier, powerful and offers a wide variety of customization options.